Our neighbors invited us over to pick some of their abundant mulberries, so we decided to make a batch of mulberry jam. 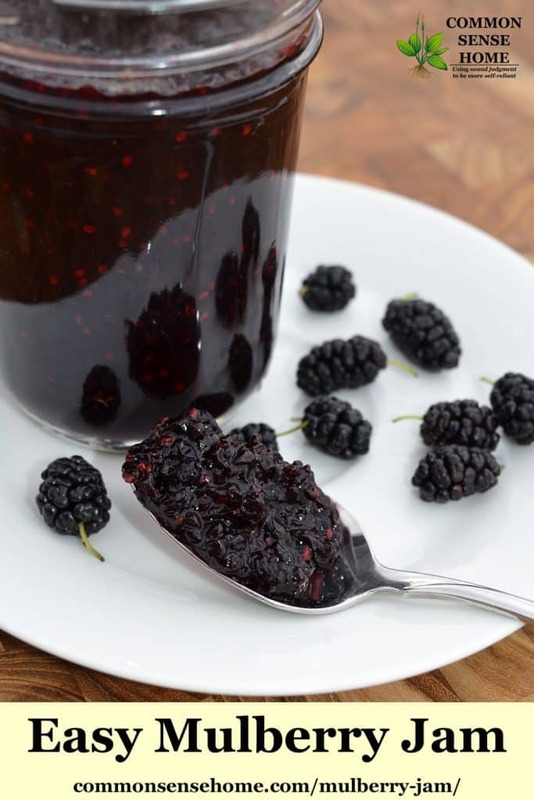 We like more fruit and less sugar, so this mulberry jam recipe uses Pomona's Universal Pectin for thickening. You could also use a different low sugar pectin and adjust the recipe accordingly. We prefer Pomona's because it is non-GMO and doesn't change the flavor of the jam or jelly. Using a small amount of commercial pectin reduces cooking time and sugar needed for gelling, giving you more fresh fruit flavor. Mulberries look similar to blackberries, but they grow on trees and the seeds are less pronounced. 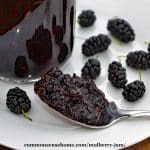 Mulberry trees tend to ripen their berries over a long period of time, so with a small tree, you may need to do several picking to get enough fruit for mulberry jam. 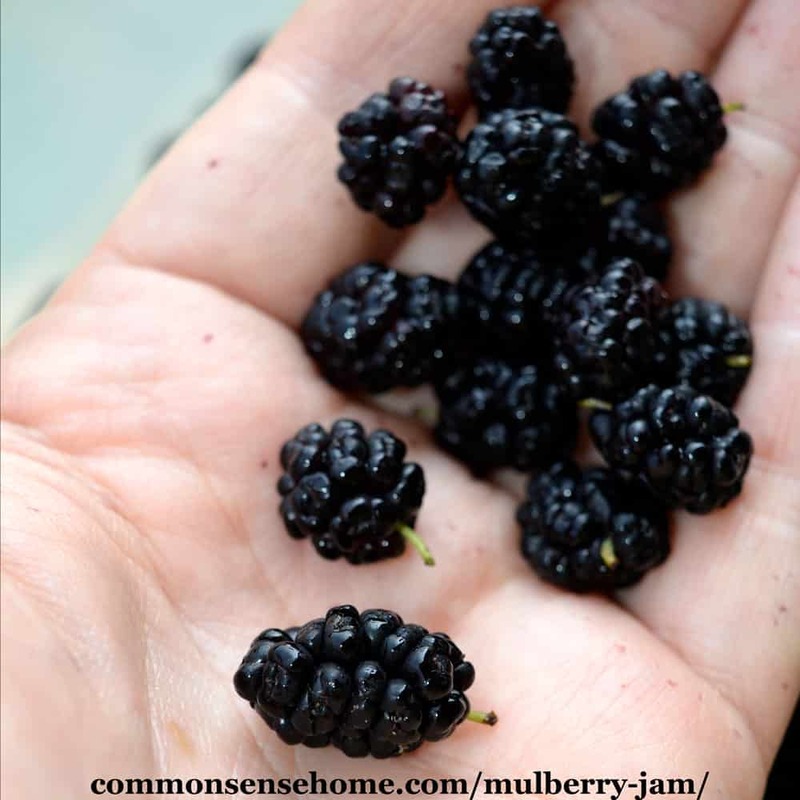 Look for mulberries that are fully ripe and release from the tree easily. You can use whatever type you have available. Ours ripened to dark purple, but there are also red and white varieties. Some people forage dropped berries from the ground, but be aware that many animals enjoy them and often leave droppings below the trees. Mulberries have small green stems attached to the berries. If you're making mulberry jam, you can remove these stems or leave them on. They are fairly soft and easy to chew, and blend into the jam. If you want to remove them, you can freeze your berries, place them in a plastic bag, and give the bag a “thump” on a counter to break them off. Alternatively, you can snip them off with a small scissors. After you've removed the stems (or not), rinse the mulberries in a colander and small them with a pasty blender or potato masher, or pulse in a blender or food processor. You can also substitute frozen berries for fresh. Sterilize five 8-ounce jars, keep hot. Prep lids and rings. Fill water bath canner and bring to boil. In a large, non-reactive pot, combine mulberries, lemon juice and the calcium water. Bring to a full boil. 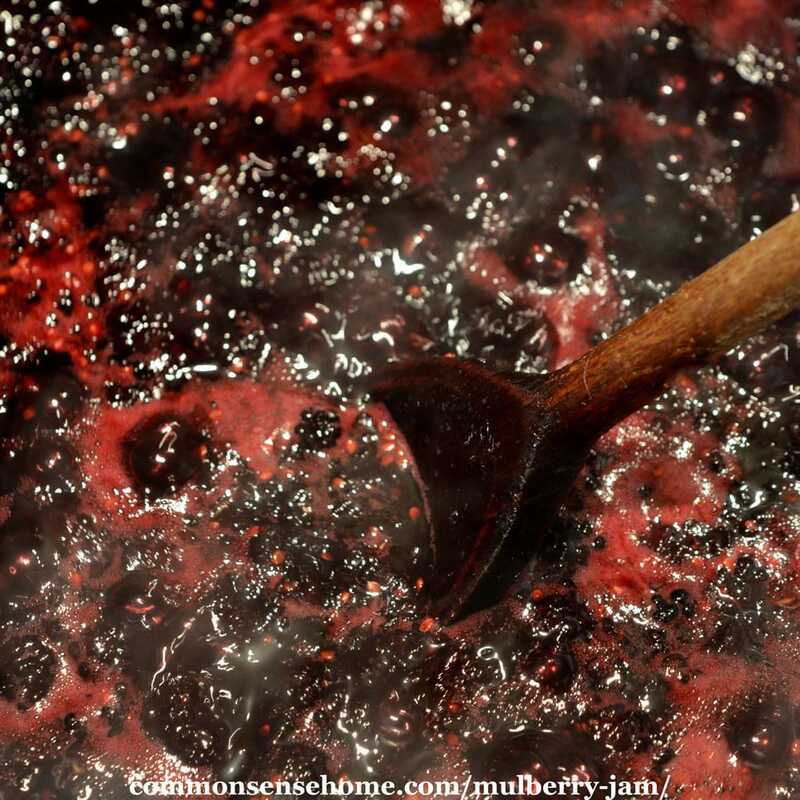 Add sugar-pectin mixture, stir mulberry jam vigorously 1-2 minutes while cooking to dissolve pectin. Return to boil and remove from heat. 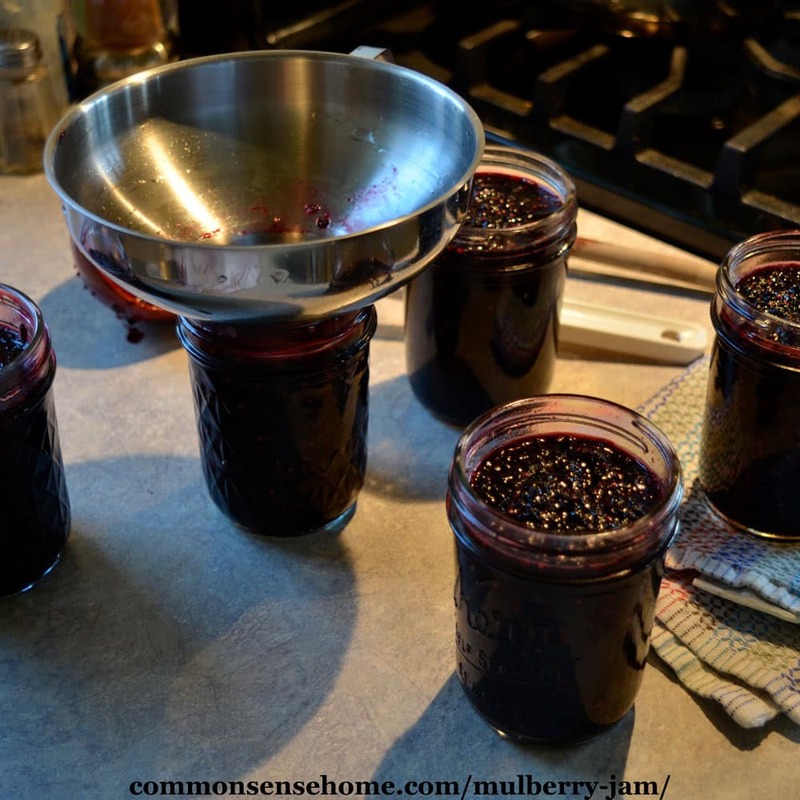 Ladle mulberry jam into sterilized jars leaving 1/4″ headspace. Jam will last about three weeks once opened, 1-2 years sealed and stored in a cool, dark location. Every box of Pomona's Universal Pectin contains two small packages – one of pectin, and one of calcium powder. To make calcium water, you simply add 1/2 teaspoon of white calcium powder to 1/2 cup of water. Mix well before each use. I keep my leftover calcium water in a small canning jar in the refrigerator, where it will keep for several months if needed. One batch of calcium water makes several batches of jam. Do I need to add lemon juice to my mulberry jam? For safe water bath canning, pH should be at or below 4.6. Mulberries are one of those fruits that has variable pH. One mulberry study testing eight different cultivars found pH values between 3.37 and 5.33. Fruits at the higher end of this scale would be unsafe for water bath canning without added acid. Why do I need to process the mulberry jam jars for 10 minutes instead of just screwing the lids on? The space from the top of the mulberry jam to the lid of the jar is called “headspace”. During processing, air is driven out of the headspace area to form a vacuum. The “plink” noise you hear when you remove the jars from the canner let's you know that a good vacuum has formed and no air is trapped above the jelly. The lack of oxygen, in combination with the acidity of the fruit and the sugar, helps to keep your homemade jams and jellies from spoiling. 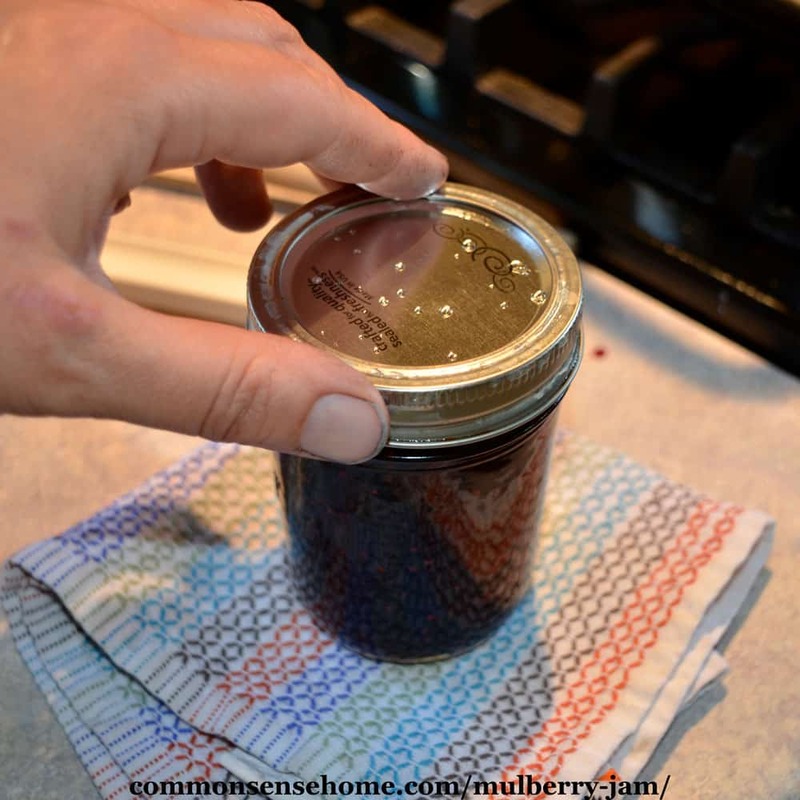 Easy, low sugar mulberry jam with loads of fresh berry flavor. 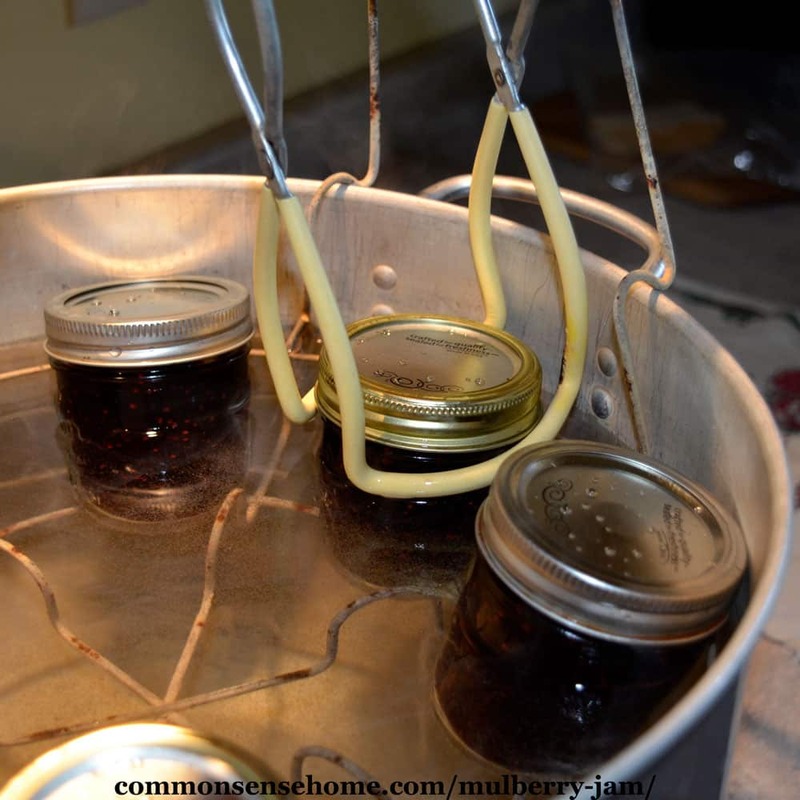 Ladle mulberry jam into sterilized jars leaving 1/4″ headspace. Wipe rims clean and screw on the lids. Process for 10 minutes in water bath canner (add 1 minute for every 1,000 feet above sea level). Jam will last about three weeks once opened. Makes around 4-5 cups. In addition to mulberry jam, we have over 20 other jam, jelly and fruit spread recipes on the site, which are all listed in the Common Sense Home Recipe Index. There are a wide variety of recipes, from flower jellies to chunky jams loaded with fruit.